Who are the People Behind the Credit Card Statistics? Are some people going into debt to buy gas as fuel prices rise? 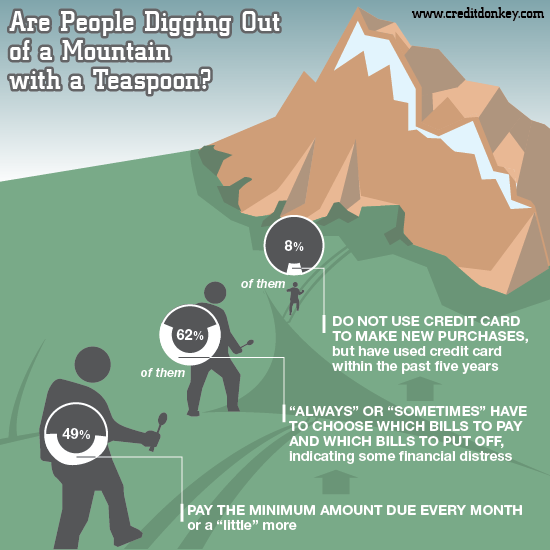 Are some people trying to dig out of a mountain of credit card debt with a minimum-payment teaspoon? How are people who are struggling financially using their credit cards and paying their bills? 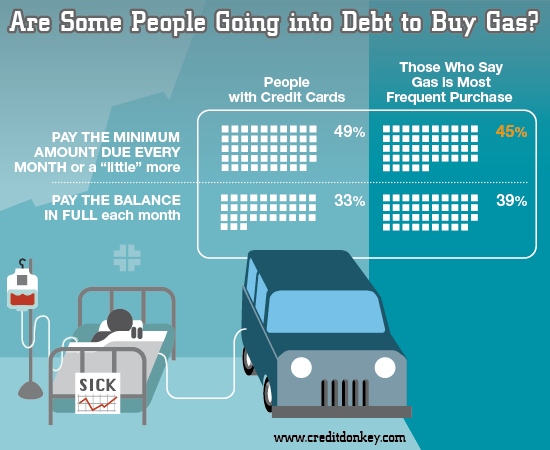 These were questions that interested us at CreditDonkey.com, a credit card comparison and financial education Web site, when we conducted an exploratory survey of 368 consumers online in February 2012. We wanted to look more closely at the people behind the national economic news and credit card statistics. Although the responses we gathered are not representative of all Americans, the people we surveyed represented a wide variety of credit card users and non-users from all income and educational backgrounds. 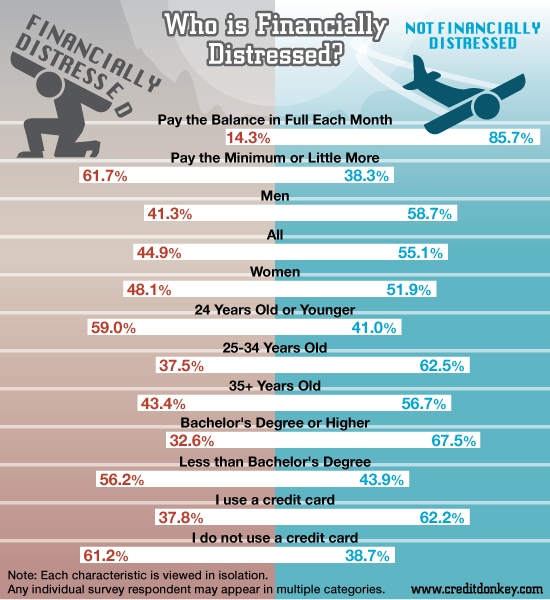 The levels of financial distress self-reported by the respondents to the survey closely mirrored results compiled by Dartmouth College researchers for a national commission that investigated the causes and outcomes of the Great Recession. Are Some People Going into Debt to Buy Gas? Forty-five percent of the survey respondents who say gasoline is the most frequent purchase they make with their credit cards also say they pay the minimum amount due on their statements or just a little more each month. These credit card users are at risk of falling into debt for a consumable and necessary item, which is a worst-case personal economic scenario that will get worse as fuel prices skyrocket. Who is Struggling in this Economy and What Do Credit Cards Have to Do with It? To measure the amount of financial distress each person was feeling, we asked, “Thinking about all your bills, do you have to choose which bills to pay and which bills to put off each month?” We considered people who answered “always” or “sometimes” to be struggling financially because they are having trouble paying their bills, while those who responded “rarely” or “never” were considered financially stable. Then we sifted the data to consider characteristics and differences among people who are strapped for money and those who are financially stable. Who Pays the Minimum Amount Due on their Credit Cards? We also wanted to learn more about the people who pay the minimum amount due on their credit card bills each month. There has been a lot of talk about that issue because a law now requires credit card companies to clearly explain how long it will take to pay off a credit card balance and how much interest will be charged if only the minimum payment is made. But early reports suggest the law may not do much to change people’s behaviors, according to Boston College researchers. From our survey, we found that people who are financially distressed are among the most likely to pay the minimum amount due or a little more. We can’t tell from this data whether paying the minimum amount is the reason people are struggling or whether they pay the minimum because they are struggling, but it seems a good bet from our data that paying the minimum amount is somehow connected to a person’s financial situation as well as their knowledge—or lack of knowledge—about the drawbacks of paying such a tiny amount each month. When we looked more closely at the people who pay the minimum amount due, we also found a small group of people who are struggling financially and pay the minimum but have stopped using their credit cards for new purchases in the last five years. Their task of digging out of a mountain of credit card debt with a teaspoon is daunting. It was worrisome for us to further find that people who primarily use their credit card to buy gas are about as likely to pay the minimum amount due as all the credit card users we surveyed. Moreover, 60% of these people do not pay the balance in full each month. Some of them could be going into debt to buy gas, which would lead to a financial death spiral as gas prices rise. Does the high level of satisfaction with credit card companies mean people are shopping around, watching their statements and weeding out predatory companies? Or are these people simply unaware of high fees and variable interest rates applied to their accounts? 79% of respondents said they would recommend their current credit card company to their friends and relatives. Are people who are dissatisfied with their credit card companies reacting, primarily, to their own financial struggles—blaming the messenger—for their own decisions? It did not seem that was the case among our respondents because 49 % of people who said they would not recommend their credit card company to a friend or relative were struggling financially by our measure. This is not different from the 45% of all respondents who were struggling. 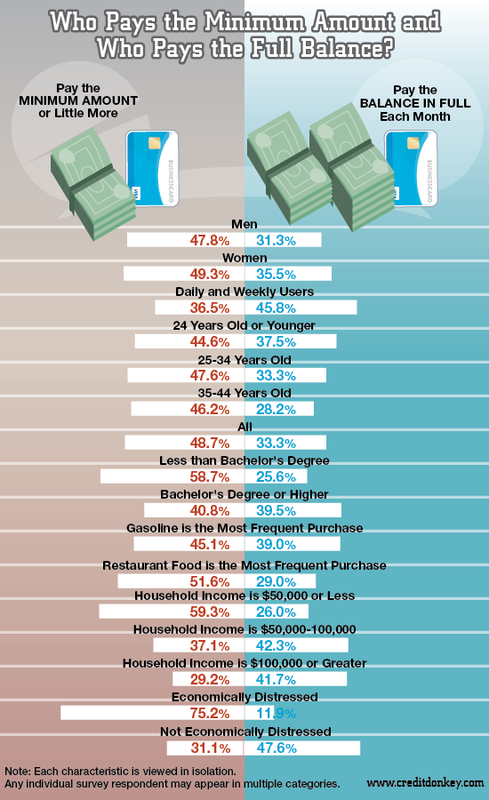 Share on Facebook "Survey: Credit Card Usage Statistics"